A recent obese client at our clinic across the Bay from San Francisco told me a pertinent story. It will interest those of you who have needed to lose weight but have had trouble doing it on low-calorie diets. Low-cal dieting, as I make clear in The Diet Cure and The Craving Cure, is the last thing someone who needs to lose weight should do—especially someone who has a “trick” thyroid. Our client said that she’d just had a group of girlfriends, most of whom had recently had tummy tucks, come to her home to do a humiliating intervention on her, trying to force her to get the surgery herself. Why was she resistant? Because, at age 45, she had only been obese for 6 years. It had happened suddenly after a surgery that removed several tumors from her thyroid gland. The thyroid governs our metabolic rate. Her ability to burn calories went through the floor because she lost much of the gland itself, and had to rely on an M.D. who paid no attention to her continuing symptoms and just kept her on a low dose of replacement Synthroid. Although her thyroid tumor story is unusual, our clinic has seen thousands of (mostly female) clients whose thyroids are malfunctioning. Why? A genetic vulnerability plus low-cal diets. These hypothyroid clients are the ones who always regain the most weight after their diets. Low-cal diets slow down thyroid function in as little as eight hours and, for many, the thyroid never quite rebounds. See The Diet Cure, chapter 4, “Unrecognized Low Thyroid Function” and chapter 12, “Thyroid Solutions” for additional guidance. Take the quick symptom questionnaire now to look for indications of low-thyroid function. 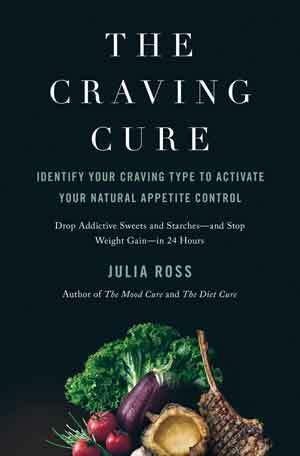 The Craving Cure’s chapter 4 adds research findings on The Biggest Loser contestants and medically monitored 500 calorie-a-day dieters that confirm the adverse effects of intentional starvation on thyroid, and other hormone, levels.